Background: Zinc transporter (tzn-1) of Neurospora crassa plays a crucial role in conidiation pathway, as its removal results in aconidiation which was reported in our earlier studies. Objectives: The main objective of this study was to analyze the role of tzn-1 in conidiation process, by comparing knockout (KO) mutants zinc transporter KO (Δtzn-1) and aconidiating gene KO (Δacon-3) with wild oak ridge (OR) 74 ‘A' strain by ‘Proteo-genomic' approach. Methods: To identify the commonly expressed protein spots in knockout (KO) mutants zinc transporter KO (Δtzn-1) and aconidiating gene KO (Δacon-3) by comparing with wild oak ridge (OR) 74 ‘A' strain. 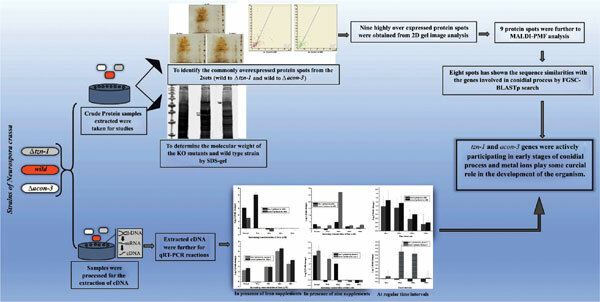 Two sets (Δtzn-1 to wild and Δacon-3 to wild) were analyzed by combining 2- Dimensional gel electrophoresis (2DE) with Matrix Associated Laser Desortion/Ionization mass spectrometry –Peptide Mass Fingerprint (MALDI-PMF). Then, the peptide sequences which were obtained by MASCOT (database software) were identified by FGSC BLASTp search analysis. Finally, to evaluate the expression of the KO mutants zinc transporter KO (Δtzn-1) and aconidiating gene KO (Δacon-3) in comparison to wild (OR) 74 ‘A' type was analyzed by Quantitative Real Time Polymerase Chain Reaction (qRT-PCR) studies. Results: 2DE and MALDI-PMF has shown the nine commonly overexpressed protein spots from the two sets (Δtzn-1 to wild and Δacon-3 to wild). Peptide sequences were obtained by MASCOT (database software) analysis and peptide sequences were identified by FGSC BLASTp search. Eight sequences have shown the similarities with the genes involved during the early stages of conidial and sexual development. Our qRT-PCR analysis has shown that tzn-1 gene was upregulated in contrast to acon-3 gene in absence of iron concentration and down regulated with increase in iron concentrations in wild samples. With increase in zinc supplements, the tzn-1 gene is normally regulated and shown contrasting feature in absence of zinc and acon-3 gene is normally regulated both in presence and absence of zinc. At regular time intervals, declined growth rate was observed after 18hours of induction. Conclusion: Thus, we conclude that tzn-1 and acon-3 genes were actively participating in early stages of conidial process and metal ions play some crucial role in the development of the organism. Keywords: Zinc transporter (tzn-1), 2DE, MALDI-PMF, MASCOT, FGSC BLASTp and qRT-PCR. Keywords:Zinc transporter (tzn-1), 2DE, MALDI-PMF, MASCOT, FGSC BLASTp and qRT-PCR. Abstract:Background: Zinc transporter (tzn-1) of Neurospora crassa plays a crucial role in conidiation pathway, as its removal results in aconidiation which was reported in our earlier studies.